Minneapolis -- (Business Wire) -- Graco Inc. (NYSE:GGG), a leading manufacturer of fluid handling equipment, is proud to continue its legacy of innovation in the line marking industry with the launch of the new LineDriver® ES system and LineLazer® V ES 2000 line striper. This package represents the industry’s first electric, battery-powered ride-on striping system. Traditional gasoline-powered engines have been replaced by high-efficiency electric motors, allowing contractors to complete any striping job without the hassle of noise, vibration or fumes. The new LineLazer V ES 2000 line striper has the increased performance needed to work with two guns simultaneously and run up to 60 gallons of paint on a single charge, making it ready to tackle any size job. Indoor applications such as factories, warehouses and parking garages are no problem. The engine noise-free performance also allows for nightime striping in populated areas without causing a disturbance. The ES 2000 line striper is available in an available HP Automatic package that features an automatic parking lot layout system and automatic paint guns to produce skip-line patterns with ease. The new LineDriver ES ride-on self propulsion system attaches to any LineLazer striper to convert it from a walk-behind striper to a high production ride-on solution. With forward speeds up to 10 mph, the LineDriver ES system will help contractors complete large jobs faster. The new LineDriver ES system also features the industry-first ExactMil™ Speed Control system that enables the operator to drive at a consistent speed to easily apply the right mil thickness of paint, allowing users to produce better, longer lasting lines using less paint. “The new LineLazer V ES 2000 line striper and LineDriver ES system are game changers for striping contractors – both in terms of line quality and improved work environment. The ExactMil Speed Control system on the LineDriver ES system and zero vibration on the LineLazer V ES 2000 line striper result in near-perfect lines every time. And for the contractor who is striping eight hours per day, working without the noise, vibration and fumes of gas engines will definitely be appreciated,” said Mike Vangstad, Global Product Marketing Manager for Pavement Equipment at Graco. To learn more about all of the innovative new technologies and new lineup of Graco airless stripers, visit www.graco.com/LineLazerES. Graco Inc. supplies technology and expertise for the management of fluids and coatings in both industrial and commercial applications. It designs, manufactures and markets systems and equipment to move, measure, control, dispense and spray fluid and powder materials. A recognized leader in its specialties, Minneapolis-based Graco serves customers around the world in the manufacturing, processing, construction and maintenance industries. 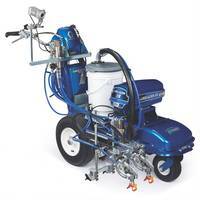 For additional information about Graco Inc., please visit us at www.graco.com or on Twitter @GracoInc. Paint Striper uses bulk paint instead of aerosol cans.